Custom Engraved Name Plates for People, Pets and More! Thank you for stopping by The Engraving Spot. We will be working hard on your orders, and wishing that you stay healthy and safe this winter. Email is checked daily, info@engravingspot.com, or you can reach out to us by phone or text at 936-727-9094. Questions will be answered, and orders will be filled as quickly as possible, however right now we are backed up and running at least 2 weeks to fill orders. The Large Raised Oval has more flair then a standard rectangular plate. Intended for use in protected areas only, it has a bright brass finish, raised beveled edges, countersunk screw holes and measures 3" x 11". We do not darken the lettering on these plates. Use the Raised Small Oval to compliment it on smaller trunks and wall boxes. 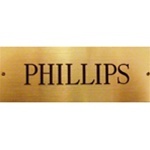 This large ornamental custom engraved nameplate measures 5/8" x 4 1/4" and is available in a satin brass finish. 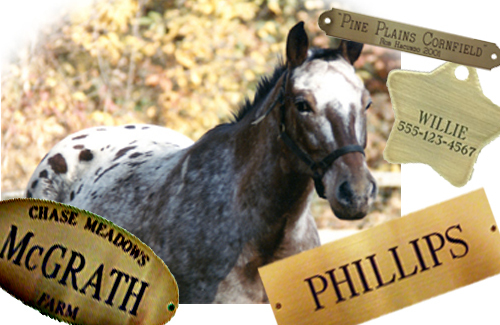 These nameplates have ornamental edges and are great for halters and tack boxes. The small brass trunk plate is perfect for tack trunks, lockers, trophies, custom furniture, etc. Lightweight brass, sized 1 1/2" x 4", it is available in both Satin Brass and Satin Silver finishes and can be supplied with either tape or screws for mounting. This plate can also be hung by chain if desired. American made by Tory - Stable Halter with FREE nameplate. 3/4" wide leather with adjustable chin strap and snap at throat. Solid brass and brass-plated hardware for beauty and durability. Horse or Cob/Lg Pony - Havana color, with your choice of nameplate. Shown with 58. Proudly display the name of your office, ranch, horse equipment or equestrian team with custom engraved name plates from the Engraving Spot. For almost two decades, The Engraving Spot has crafted clear, custom-made horse and dog ID tags, trunk name plates, pet name plates and more for animal lovers everywhere, as well as nameplates for the office and beyond! Choose from a variety of sizes, fonts, borders, decorations and finishes to find the perfect engraving that represents your name and your favorite pet. Show unmistakable ownership and present your ranch, office, team or family title on personalized brass name plates for trunks, stalls, signs, pictures, collars and more. Custom engravings are also a great way to commemorate and honor loyal, winning horses, loving dogs and other pets and keep their memory close. Design your own stall name plates, ID tags and other distinguished identifiers starting from polished brass. Add simple or elaborate designs to make a powerful statement and represent your unique signature. Find your design and make a permanent plate to display your name for generations to come. View The Engraving Spot’s solid brass plates and start a custom sign for your farm, ranch, office, stall, trunk, pets and more. Made in America by Tory Leather, this bridle leather leadshank matches our Tory halters. 1" in width, with a 24" solid brass chain, stocked in Havana color only. Each leadshank comes with your choice of 1 free nameplate.